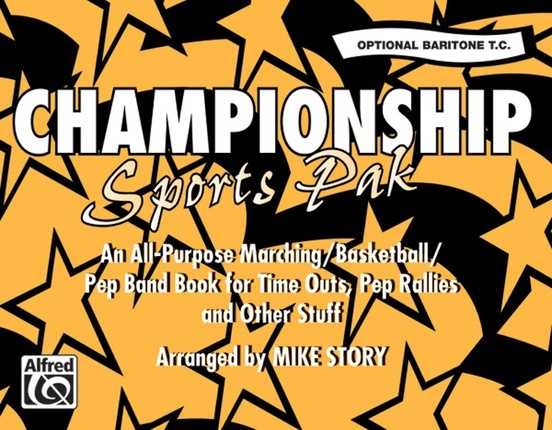 Championship Sports Pak is full of great hit tunes that everyone loves to hear during the game. Short "sound bites," riffs, and hooks that fit in and around the action make it easy to pump up the crowd (and the team). Complete instrumentation with lots of doubling means you get a full sounding song regardless of the size of your marching band. The entire collection is full of winners, and the price makes it impossible to resist! The song titles are: Land of a Thousand Dances * Imperial March (Darth Vader's Theme) * Gonna Fly Now (Theme from Rocky) * Wooly Bully * Your Mama Don't Dance * Celebration * Star Wars (Main Theme) * Freeze Frame * Dragnet * Mony, Mony * Barbara Ann * Gimme Some Lovin' * Jump * La Bamba * Hang On Sloopy * Louie, Louie * Macarena * My Sharona * Oh, Pretty Woman * Merrily We Roll Along (Theme from "The Bugs Bunny Show") * Star Spangled Banner.